It’s no secret that Facebook has ambitions to become more than just a social network. Over the last twelve months, the company has launched a hyperlocal services feature, a jobs search, an events forum, and even a test option to let users order food and book movies right from within its platform. And now, Facebook has made a big move towards e-retail. 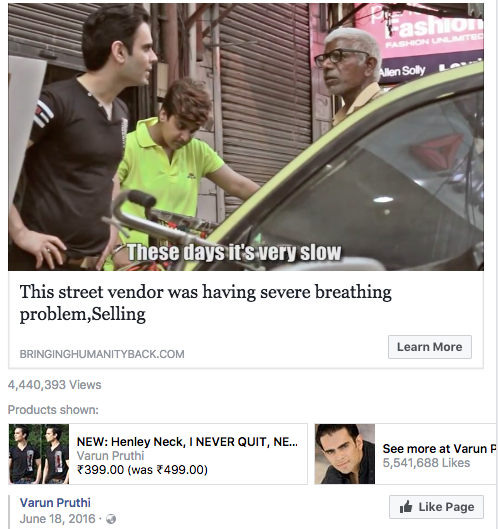 Facebook is now letting users buy goods right from within their Facebook timelines. Facebook has introduced a new feature, where Pages can attach “Buy” widgets onto other forms of media, such as videos. Each time the video appears on a user’s timeline, the buy widget appears with it. Clicking on the product – in this case a T-shirt – takes the user to a Facebook interstitial where they can select the size. A button then takes them to the checkout page of the store, where they can directly purchase the product. The new feature isn’t Facebook’s first foray into e-commerce. The company has let companies have a “Shop” option on their pages for a while, where they can list out their products, and then eventually end up buying them from the store. But attaching the “buy” widget to videos and posts brings the buy option straight into people’s timelines. And that is crucial. Facebook’s timelines are among most valuable bits of digital real estate around – Facebook has over a billion monthly users, who regularly spend countless hours scrolling through them. Until now, brands could only get buy buttons straight to timelines through sponsored posts. Now they can attach them to any piece of content, and give users who spot their posts an opportunity to immediately buy their products. The move shows that Facebook is keen on having more commerce happen through its platform. This would pit it against Google, which is the market leader in directing people to places where they can buy stuff, and Amazon, which essentially connects users and goods. Facebook already has a head start towards becoming an e-commerce giant – the company has users who spend plenty of time on its platform, and it knows what these users like and dislike. Attaching a buy option to normal content could open up a whole new category of casual buyers, who aren’t actively looking to purchase stuff, but are tempted while scrolling their Facebook timelines. Google and Amazon might just have some serious competition on their hands.